The world of Minecraft is beautiful and huge. To make it easier to move your possessions, you need to make a car in minecraft. With it you can also tame an ocelot, a ride with friends to quickly escape from the battlefield, as well as significantly increase the inventory due to the roomy trunk. So easy and quick to make a car in Minecraft, install on your computer special mod the car mod. Stock up on the necessary resources. To build the machine, you will need: red dust, 2 pistons, oven, 2 torches, 4 pieces of iron, 16 pieces of leather, the chest. To make a car in Minecraft, you first need to craft the engine. It will move the window crafting 2 of the piston edges and the red dust in the center square in the corners of the bottom row put the torches and in the center of the oven. Thanks to these simple manipulations you will be the basis of future machines. To make wheels, in the center of the craft, place a piece of iron, surround his skin. Operation must be repeated twice to make a machine in Minecraft 4 wheels. Do not be surprised that they turned out square, because in this game they don't care about building will have a great ride. Assemble the engine, the trunk, 2 pieces of iron and wheels. 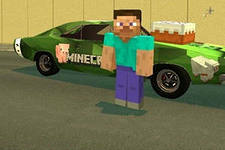 Using these elements, you will have to make a car in the game Minecraft. To go, place it in charcoal. Help her the keys W (forward), A (left) D (right), C (open the trunk), SHIFT (brake). Thanks to fashion The car mod you will have not only the opportunity to build the car itself very much, but to make the road around the city, Parking garages, tunnels and other transportation facilities.